Looking for a way to feel even more relaxed in your own home? How about a hot tub? When you come home from an 8 to 5 job, you will definitely be tired. A nice sip of a brewed coffee would be nice to ease the stress away. But it would even be better if you can actually submerge your entire body into a soothing warm or hot water. Now, this sure is a perfect way to de-stress! So what is the answer to this? Apparently, a nice warm bath in a hot tub or Jacuzzi would be amazing! That is why some homeowners made sure that they will get one for their home. Well, we cannot blame them for having that desire because aside from the comfort and relaxation it gives, it is also a nice sight in the house. Yes, it increases the value of a home and it also makes your home an even more comfortable place for you. Wait. So, you are planning to add one? 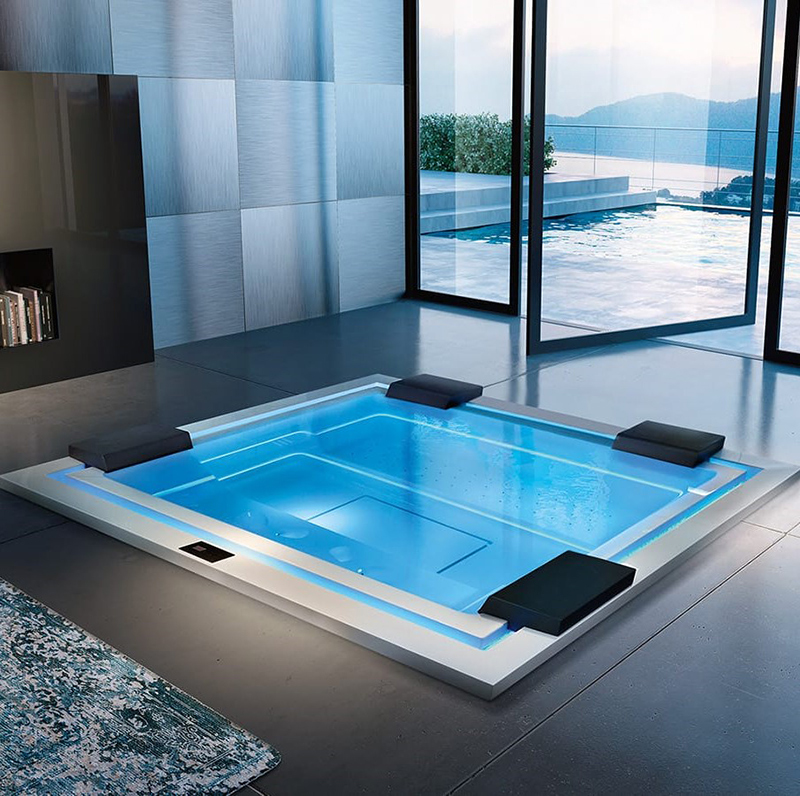 If yes, you would love to see this collection of beautiful interior images showing hot tubs. 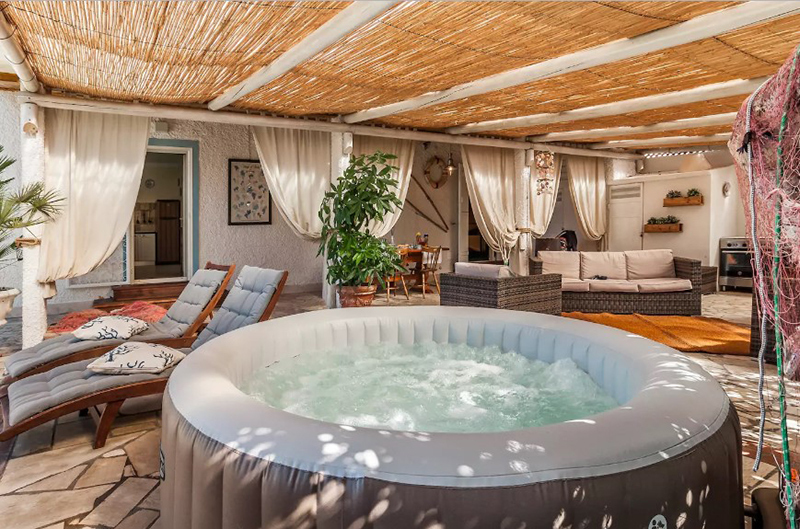 But what if you are not interested to add an indoor Jacuzzi? No worries, just continue scrolling down and feast your eyes on the relaxing interiors that you are about to see. Who knows? This might actually change your mind! So what are you waiting for? Dive in and take a look at the stunning images below. You might feel warm and relaxed merely by looking at the images! If you have a place as beautiful and relaxing as this, you would definitely want to go home at once! Isn’t it nice that aside from the hot tub, it also has a good view of the mountains and the city lights? The warm lights inside add more warmth to the entire place. 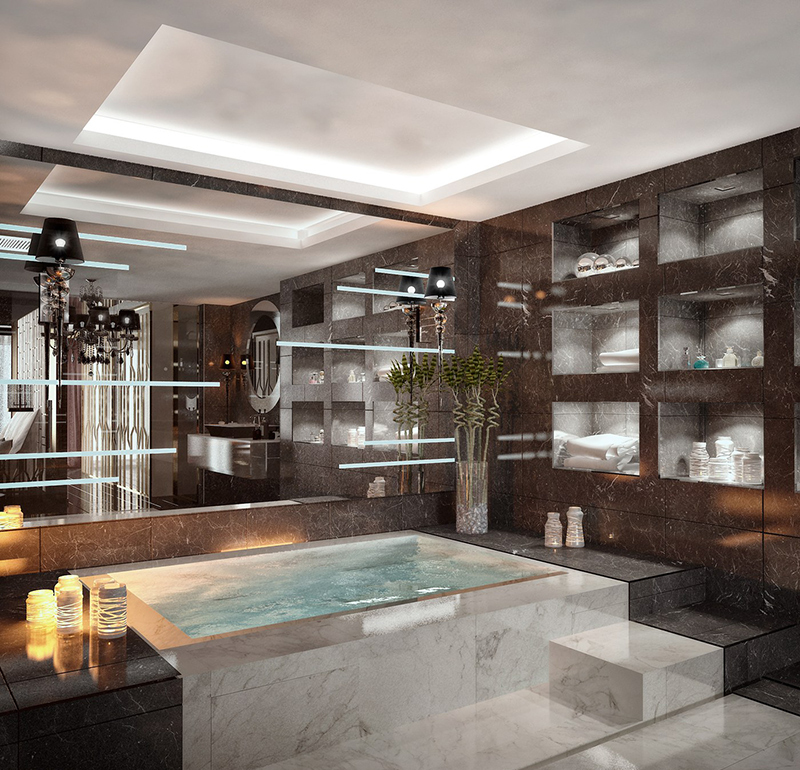 A luxurious bathroom with a built-in hot tub. Anyone who gets into this bathroom will no doubt admire its modern sophistication which is seen not just in the tub but in all over the place. Even the lightings and their choice of tiles are gorgeous. 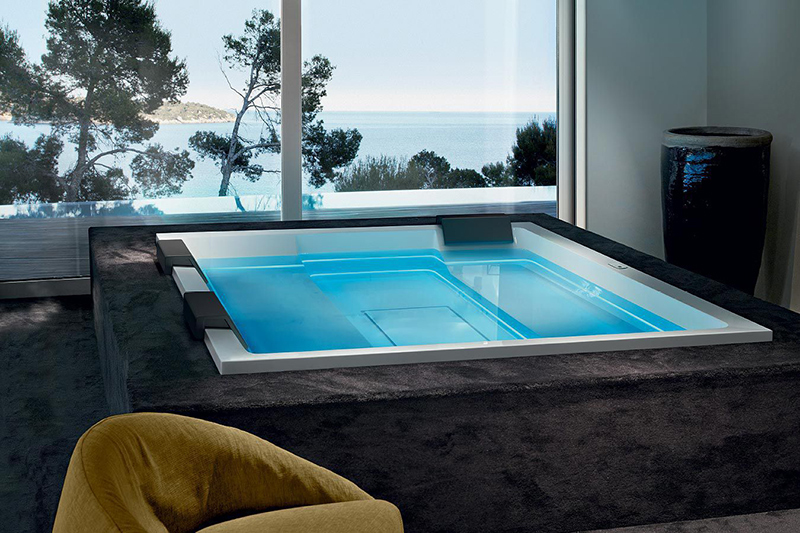 This Jacuzzi from Falcon Pools will give you the ultimate experience of relaxation. This area seen in the image above is located near the home’s gym which is just the perfect spot for a warm bath. 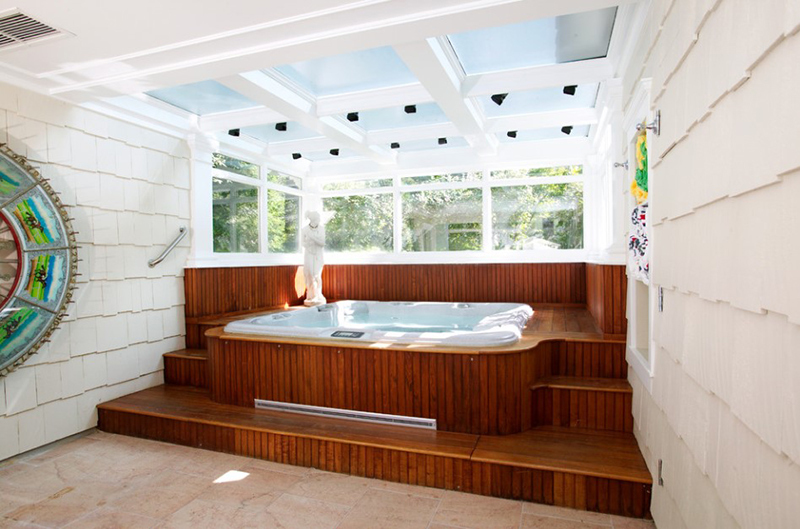 The skylights and window bring in natural light into this space where the hot tub is located. Just imagine how dramatic this will look like during the night! 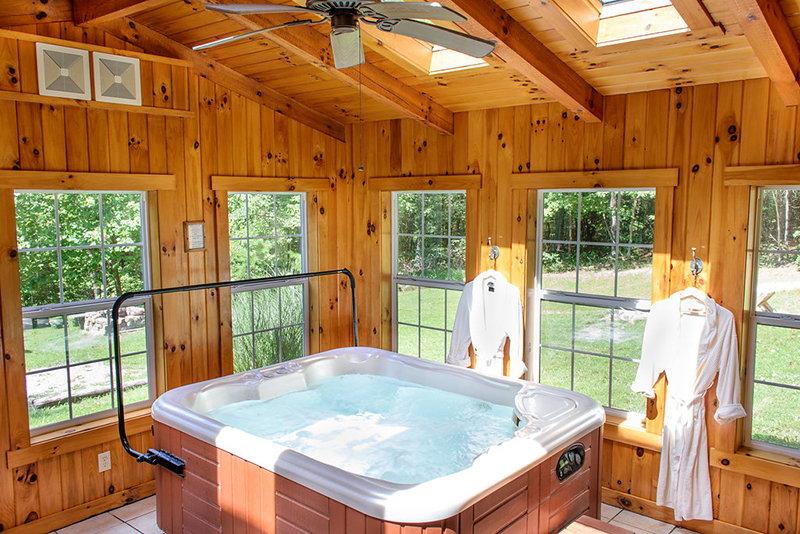 If you want to have that indoor-outdoor feel while in your Jacuzzi, then try to create a small shed like this where you can place your hot tub. It could either be a separate spot or just an extension to your existing home. Using wood with it makes it appear more relaxing. 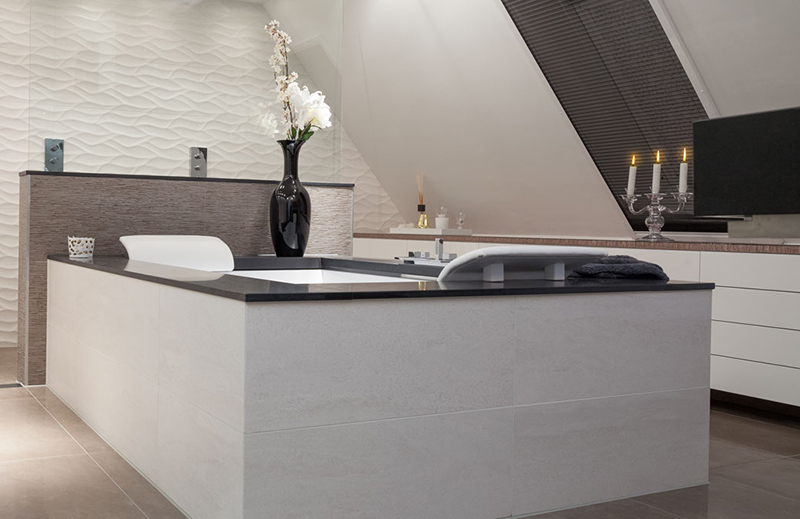 Who would not fall in love with this modern bathroom in aprivate home in Netherlands? Its neutral colors and modern touches give this space a luxurious modern appeal. 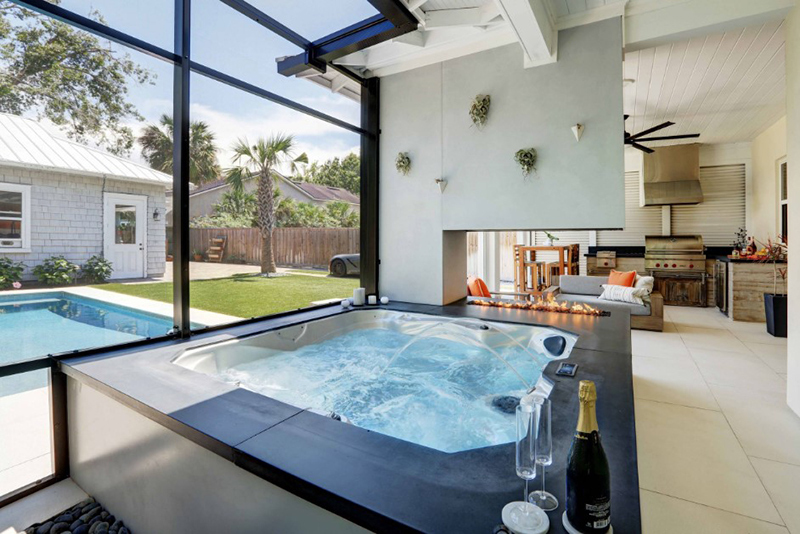 The hot tub makes everything even more inviting! It’s not just the interior that is stunning but also the view! If you have a place like this you will surely feel totally relaxed. I don’t know about you but the first thing that came to my mind when I saw this is a plate. Lol. But it does look good in this wooden home with glass picture windows. How would the people outdoors feel while watching you splash water inside despite the freezing weather? If you want to learn more about windows, you can read our article about the things you need to know about windows. This one has a separate room for the spa and hot tub area. You can do that too and make your home totally relaxing. The wooden materials add warmth to the space. This modern home is very cozy indeed! Just take a look at that hot tub and a modern fireplace near it. I’d say this one is really like an indoor pool especially that it is very big. Looks like it can accommodate about 8 people. What’s nice about this is the seating area at the rear part of the space and the outdoor living area. Love the Bohemian feels of this space! You can see that though the bamboo roof and the curtains as well as the choice of fabrics for the pillows. 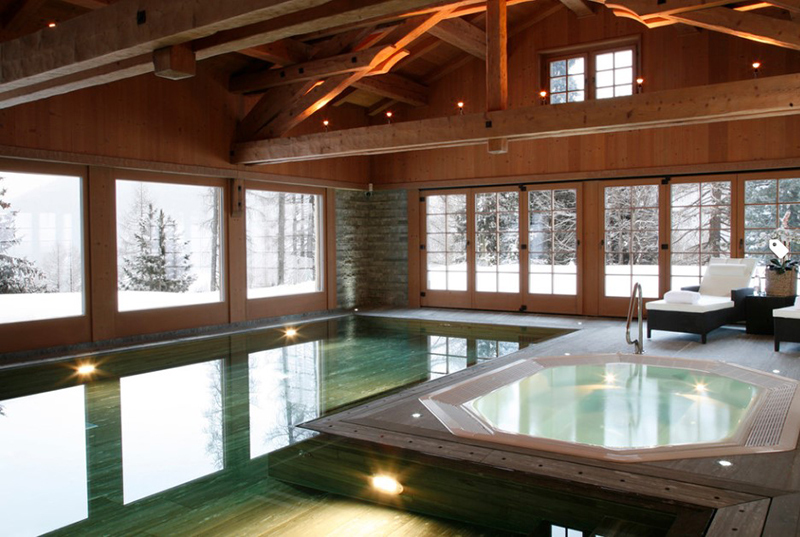 For sure, getting into this hot tub will make you feel very relax especially if the place is as fancy as this. How about an elegant modern home like this with a hot tub just beside the pool? This provides you options as to where you would love to dive in. 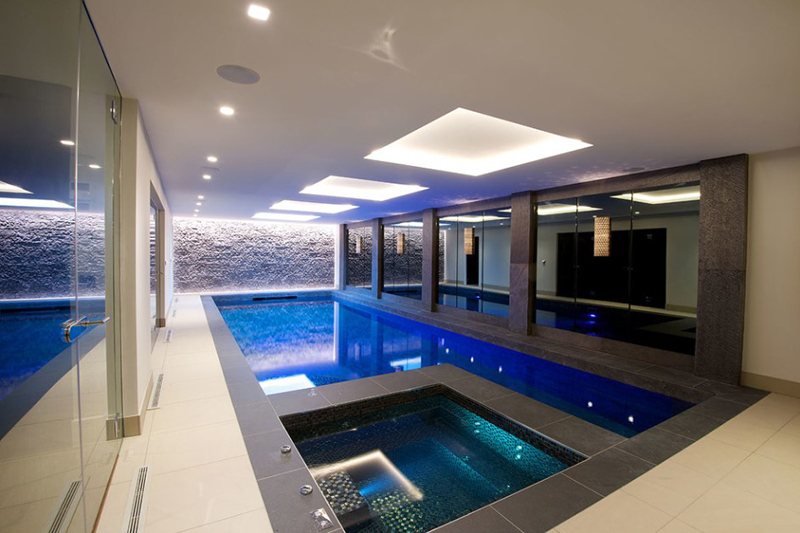 That black marble wall on the side adds sophistication to this indoor pool area. Who would think that a transitional seating area like this can actually have many amazing features like the wine cellar on the side and an indoor Jacuzzi! It would really be nice to entertain guests in here. Bring in the tropical feel of your home with a bamboo wall and hanging air plants. It’s also very nice that this area can be accessed straight from a seating area. Who would not admire this beauty? Apart from the hot tub, the entire area looks really warm and relaxing. It is an added bonus that the area features indoor plants and there is a good view of the trees outdoors from the glass window. At first glance, you will think that everything is outdoors. But in truth, the hot tub area is located indoor. This is a good idea so that those who want to soak in the warm water can just do it whenever they want to- even when it’s raining outdoors! I also love the design of the hot tubs as well as the entire pool area. 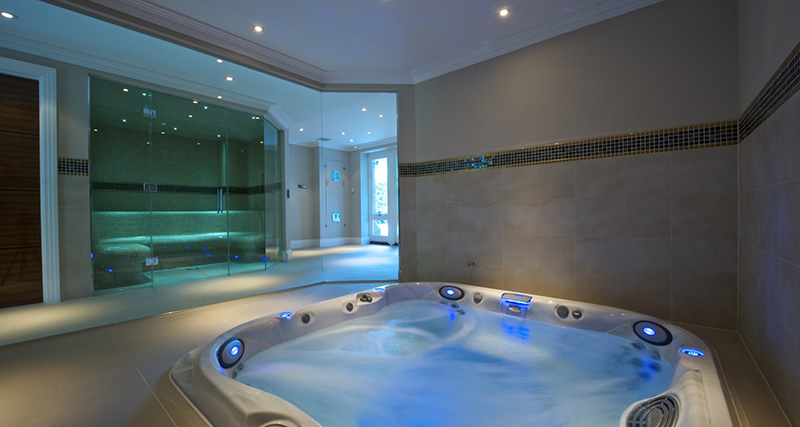 This Zen hot tub has a hydromassage as well as LED chromotherapy for overflow. If you are someone who wants a techie way to relax, this is a perfect choice! Plus, it looks very beautiful because of its modern appeal. Anyone would love to own a modern space like this. 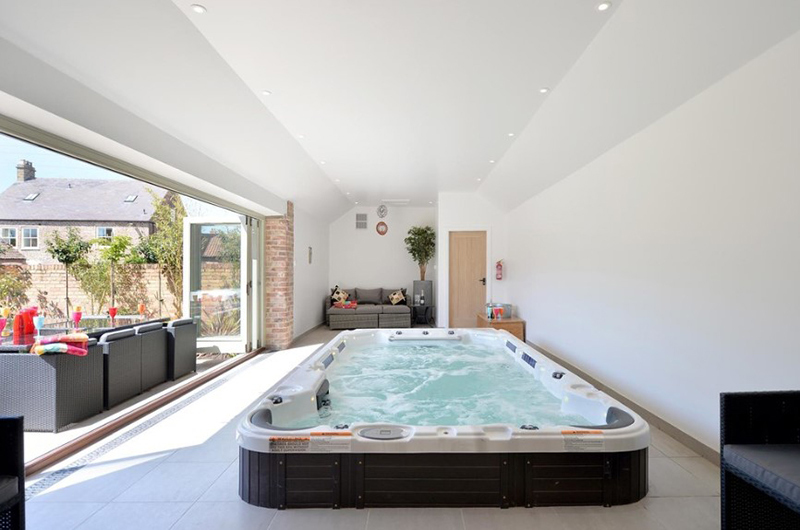 It isn’t just the hot tub that makes this inviting but as well as the stunning view of the waters that one can get from the picture window. It’s also nice that the area around it is covered with carpet! 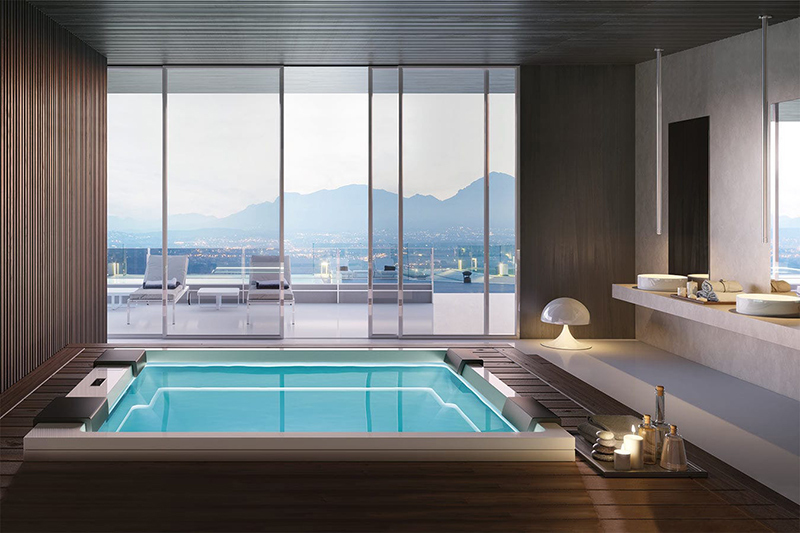 An indoor modern pool with a hot tub will no doubt complete our relaxation at home. There is no more reason to go far if your own home has all these amenities! 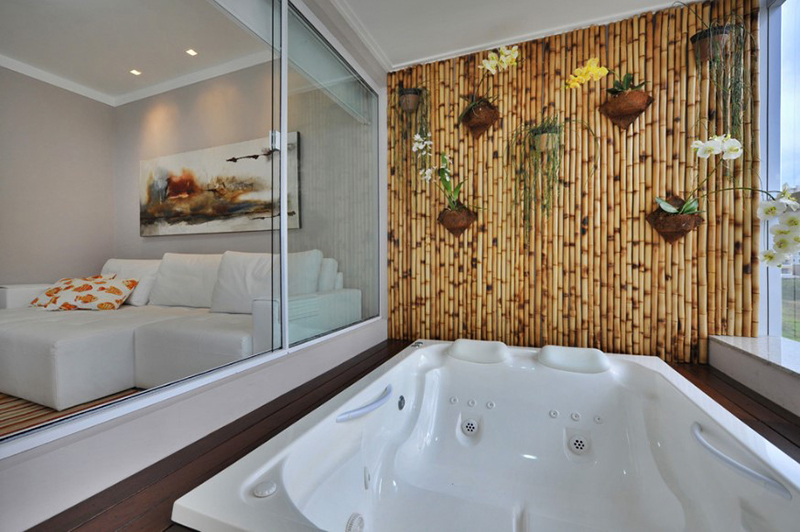 For sure, you will agree that all these indoor Jacuzzies or indoor hot tubs are very inviting! 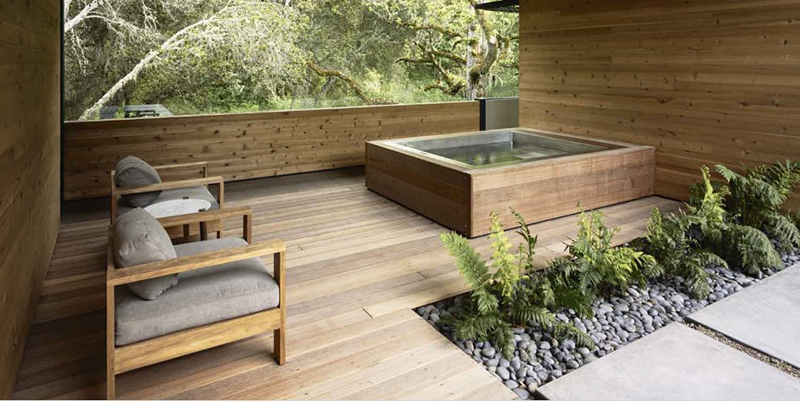 This will either inspire you to get your own hot tubs or you might drive to the nearest hot spring. But whatever you will do, we are certain that we succeeded in letting you enter into these comfy and warm interiors that we have shown you. It would really be nice to have your very own space where you can feel the warm water and relax from a tiring day at work. But make sure that you don’t just think about the Jacuzzi. You should also need to consider the design and look of your entire space too.